Pope Francis is swiftly becoming my favorite Catholic Pope. First he took the name Francis in honor of St. Francis of Assisi who lived a life of poverty and yet reached out and helped those poor and vulnerable people any society seems to have in so much abundance. After decades of focusing almost entirely on opposition to abortion and the most traditional Catholic teachings, this Pope decided that while keeping these teachings just as they are in the Church, he would embark on a re-emphasis on something that has been neglected in my lifetime in the largest sect among Christians all over the globe: helping the poor and needy as commanded by Christ. Jesus of Nazareth never taught the necessity of defending capitalism per se Mr. Limbaugh and Mr. Hannity and Mr. O’Reilly you good Irish-Catholic boy. You too, Mr. Napolitano. Shame on you all: even conservative right wing fundamentalist Christians who themselves demonize the poor and defenseless. Just a cursory view of the Scriptures or Holy Bible will show us that Pope Francis is teaching and modeling in his personal life as the Pope all that Jesus taught. It is a stunning display of goodness and mercy for a group of people who are powerless to defend themselves against a world capitalist order that frankly has gone beyond simply providing jobs and honest pay, and the economic growth that makes all men prosperous. Pope Francis is correct when he points out that the manner in which the world’s free market economies are now operating is to destroy the common man and to prey upon him. Jesus, in meeting Nicodemus in the early chapters of the Gospel or Good News, told the man, himself respected for his probity and moral conscience, that it would be easier for a camel to be threaded between a needle than for a rich man to enter the Kingdom of God. Ouch. In Matthew 25:31-46 we are told straight out that if we fail to give the thirsty something to drink, the hungry something to eat, visit and comfort the imprisoned, clothe the poor, and to welcome into our very homes and hearts, all these things are NOT being done for God and he notices our lack of empathy and compassion “for the least of these.” Failure to do these things at the judgment day will simply mean damnation to hell for those who cannot do these things. Ouch big time wealthy capitalists. Rush Limbaugh and the rest this of course means your shows and careers are over, at least on this earth and in heaven. You may be able to spew your lack of compassion for the poor in hell. One rich man in a parable Jesus taught neglected a poor man, Lazarus, who was right out in front of his palatial home. The man was there in rags each day eating crumbs left by dogs. The rich man ended up in hell, which might be as simple as being placed where God’s justice, goodness, and comfort are entirely absent for all eternity, and the Devil or the Evil One holds sway.. The man appealed to God to give him something to drink. Not possible. He then appealed to have someone tell his five brothers what happened to him and warn them. Lazarus was seen in heaven with God and Elijah the Great Prophet holding forth in comfort and peace for all eternity. In Isaiah, one among many admonitions actually applies to those who rule or govern, so leaders are enjoined not to issue iniquitous decrees (laws) and to prey upon the needy, or the poor, and the orphan and widow, two figures in society of that time that were most vulnerable as “the least of these.” So the Holy Scriptures teaches strongly that even non-Christian government leaders are directly held responsible too. Jesus himself came to his home town of Nazareth and read from the Torah, this very book, where Isaiah says that someone is coming to care for the needy and rescue the orphan and the widow and set the imprisoned free. Jesus had just begun his actual ministry and before he sat down told the gathering in the synagogue of Nazareth, as humble as it was that this prophetic prediction had just become reality within their hearing. Micah advises that we humbly walk with the Lord and practice all his ways and to seek justice, meaning social justice and not the retributive kind. Proverbs 31 has specific advice for a king from his mother to do justice to the poor and needy; exactly what Pope Francis seeks to do and is doing with such uncomfortable flair. Could it be that those wealthy men simply know they are being evil and do not like their consciences to be invaded and pricked so solidly? What Jesus the Son of God taught while on Earth thousands of years ago, and in anticipation of his coming back in all his Godly glory to judge all men and women was a very strong default setting for our behavior in favor of those most vulnerable among us: the poor, needy, or “the least of these.” These teachings of the Christian Church are uncompromisingly given. Yet right wing religious leaders too are way too uncomfortable with these teachings and seem to have not learned or forgot what is a core set of teachings from God, in both the Old and New Testaments. It is not incumbent upon the Disciple of Christ to defend capitalism. It is NOT at all a part of the Christian walk. It is secular men who worship wealth first or try to serve two masters that Jesus taught could not be served and to their detriment. If you want to be a Disciple of Christ your compassion must be for the poor first and how to make the rich even richer is not a consideration. 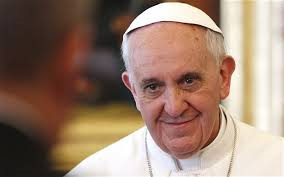 When these right-wing talking heads said the Pope was actually a Marxist he replied that he has met many Marxists who are wrong, but that he does not mind and that some of them were decent people. Pope Francis has set his course well beyond Marxism and Communism or Socialism to the teachings of his Lord Jesus the Christ. He is right where he needs to be on this issue. in Praise of Jesus Christ, Amen. This entry was posted in Essays, National Affairs, The Faith Community and tagged Catholic Pope, Chrisitan Teaching on the Poor and Needy, Francis, Isaiah 10: 1-4, jesus of nazereth, Lazerus. Jesus the Christ, Marxism, Matthew 25:31-46, politcal right, Pope Francis, religious right, rush limbaugh, St. Francis of Assisi, The least of these, traditional Catholic teachings. Bookmark the permalink.